The thing about failure is that we have all been conditioned to be so dang scared of it. This is because how we were raised. We were punished if we failed. Especially in school. We were so scared to do bad and get things wrong. And when we did, it actually jeopardized our future! If we fail a test, we may not graduate. If we don’t graduate, we can’t take care of ourselves. And if we can’t take care of ourselves, then we will look like a FAILURE to everyone! 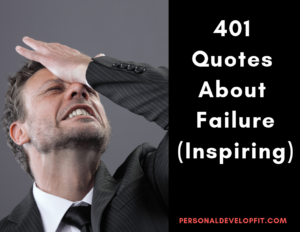 This is one of the main reasons why I made this list of quotes about failure! To show us that it is the door of which success is on the other side. And as a matter of fact, if you are not failing, you are not innovating. You are not moving forward at a rate to where you can learn and grow. And become a better version of yourself. We need to look at failure entirely different if we want to actually succeed in your life. Don’t fear it anymore my friends! There is nothing to fear. If you fail at doing something, see it as you learning how not to do something. Then learn from it and do it again. Try until you succeed. It is not falling down that makes us failures. It is STAYING down. That is when we fail. As long as we keep getting up, dusting ourselves off, and getting back after it, we are never a failure. This is imperative to know my friends. Fear giving up completely. Not temporary failure. See it as a stepping stone on the road to success. And you will never fear failure again. You will actually embrace it. As you know it is an ingredient to the success that you wish to attain in your life. “If you are doing your best you won’t have any time to worry about failure.” – H. Jackson Brown Jr.
“Failure gets you closer to what you’re good at.” – Louis C.K. “The number one reason why people give up so fast is because they tend to look at how far they still have to go, instead of how far they have gotten. “There is no doubt in my mind that there are many ways to be a winner, but there is really only one way to be a loser and that is to fail and not look beyond the failure.” – Kyle Rote Jr.